Home » Breathing: a constant requirement, but is respiratory muscle activation adaptable? Breathing: a constant requirement, but is respiratory muscle activation adaptable? Over 15 000 times every day we draw air into the lungs by expansion of the chest wall and abdomen; we breathe. This movement occurs by activation of inspiratory muscles from electrical signals from the brain to the respiratory motoneurones in the spinal cord. There are many inspiratory muscles that can expand the chest wall and abdomen, and through our research, we want to determine how the brain ‘decides’ which muscles to activate and why. How are signals from the brain distributed among inspiratory muscles during resting breathing? Data using measurements of single motor unit activity in human inspiratory muscles suggest that networks in the spinal cord sculpt neural drive from the brain (Hudson et al. 2011). Why is there a distinct pattern of activation of inspiratory muscles in breathing? Many muscles can expand the chest wall and abdomen, but in resting breathing there is a distinct pattern of recruitment of muscles which affect the precise timing and magnitude of activation of these muscles during a breath (see Butler et al. 2014). The pattern of activation is thought to be related the mechanics of the muscles and the relative contribution that the muscle can make to chest wall and abdominal expansion. In this recent publication, we used changes in body posture to determine if the activation of the human inspiratory muscles can be altered. An upside-down posture, with subjects suspended from the ceiling by their ankles, was chosen as the reversed effect of gravity was hypothesized to alter the mechanics of the chest wall, lung and respiratory muscles. This research provides clues as to why a distinct pattern of inspiratory muscle activation occurs. We found that the mechanical effect of the upside-down posture activation differentially modified the activity of two inspiratory muscles compared to their typical activation in the upright posture. Activation of the diaphragm, the main dome-shaped inspiratory muscle that sits below the lungs, was unaltered. However, for the scalene muscles in the neck, that are usually active to elevate the ribcage, activation was reduced by approximately half. 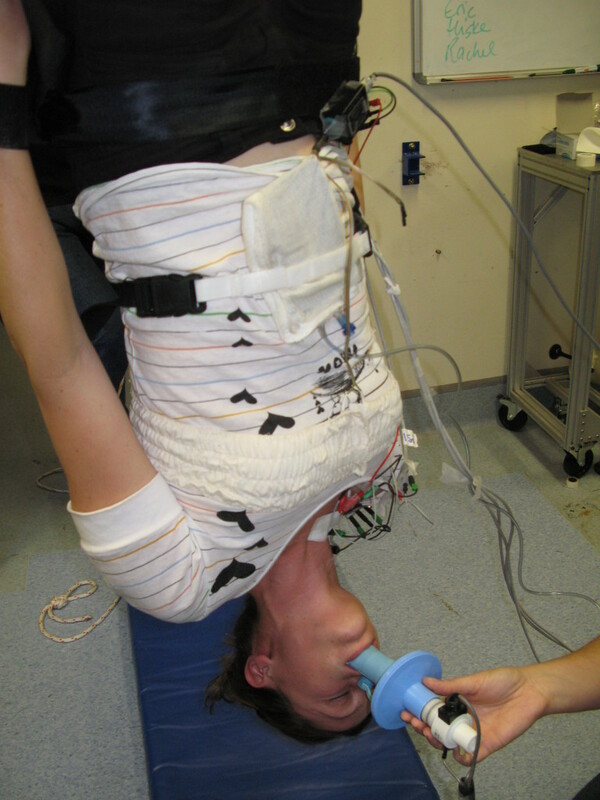 Large concomitant increases in transdiaphragmatic pressure or ‘force’ suggest the ‘efficiency’ of the diaphragm was increased during breathing in the upside-down posture. Efficient muscle contraction is important for all movements that we make, but particularly for breathing. The change in inspiratory muscle activation with a change in posture demonstrates that the activation of these muscles is adaptable to the wide range of postures that humans can adapt. Furthermore, it highlights the importance of the link between the mechanical effect of a muscle and its activation by the brain. Hudson AL, Gandevia SC & Butler JE (2011) Control of human inspiratory motoneurones during voluntary and involuntary contractions. Resp Physiol Neurobiol 179:23-33. Butler JE, Hudson AL & Gandevia SC (2014) The neural control of human inspiratory muscles. Progr Brain Res 209: 295-308.